Chitrangda Singh? Haven't heard this name? Well, she gave a splendid performance in movie 'Hazaaron Khwaishein Aisi' and since then has been missing from bollywood action. She will be making a comeback soon and you can catch the beauty on the cover of latest issue of Verve Magazine. [Click on pic for full view] As the magazine put forward - new Age Sensuality, her unconventional looks and talent appeals to many. She will make comeback with loads of movies including 'Aur Devdas' where she will be seen in bold avatar. 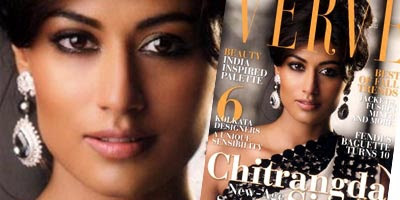 Grab the mag to know and see more of Chitrangda Singh! WOW man... she is so beautiful!